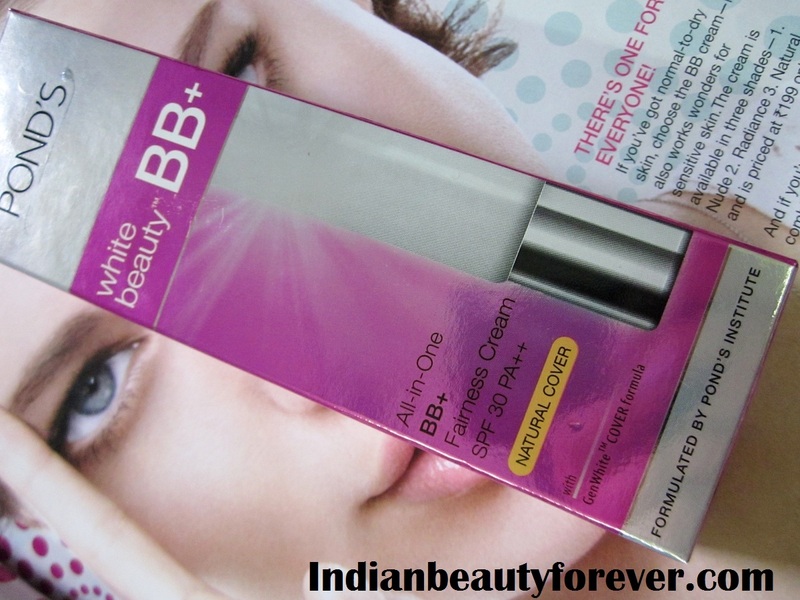 Ever since Maybelline BB cream was launched in India, other brands too has shown keen interest to launch their own versions of BB’s to encash their rising popularity here. Latest of them being this Ponds all in one BB cream (natural Cover). You may not really compare them with the original BB creams but they are like a good alternatives to tinted moisturizers with some SPF, suitable for those who like or need sheer coverage. Count me in!! and this is why I love to try BB creams, moreover, the price is affordable that makes them worth trying. So, how’s this one and what to expect from it?? Keep on reading! Price: 125 INR for 18 gms (small trial pack is also available for 69 INR). 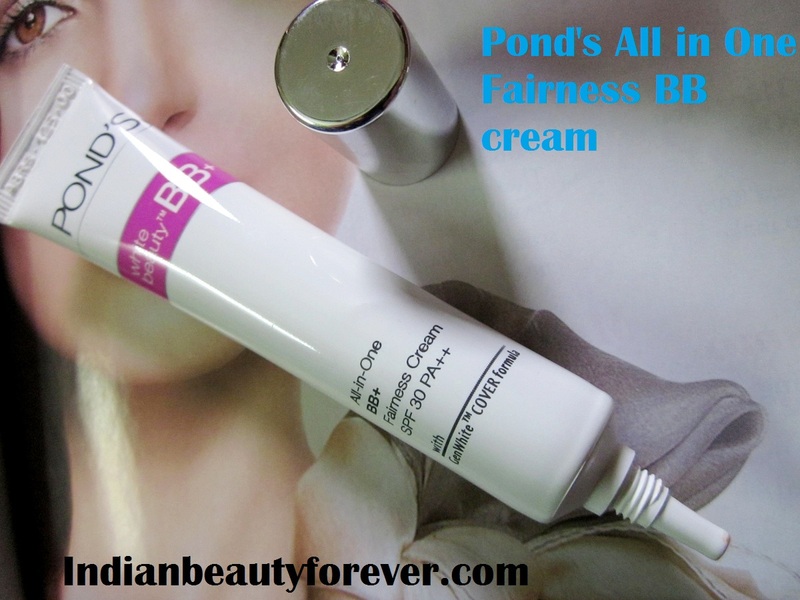 About ponds BB cream: The first of its kind innovative beauty solutions from the Pond's white beauty portfolio combines the dual benefit of instant coverage of spots as well as lightening skin within to help reveal perfect natural look. 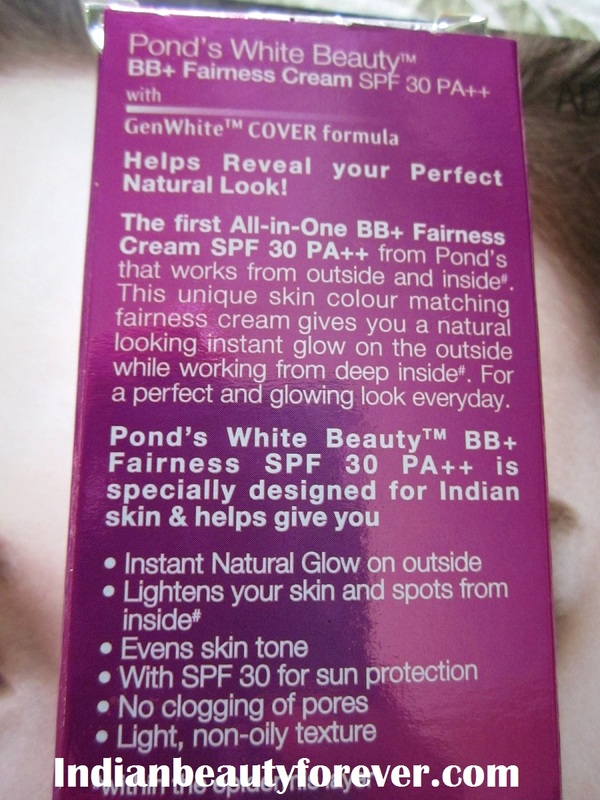 Pond's white beauty BB fairness cream with SPF 30 PA and GenWhite cover formula provides natural coverage suited for Indian skin that conceals spot instantly while working from deep within epidermis to lighten stubborn spots for all day instant spot-less radiant skin. Providing multi-targeted coverage with skin lightening benefits that lasts throughout the day, Pond's white beauty BB fairness cream is the perfect complement to the Pond's daily face care regime. Instant natural coverage. Non-pores clogging. Light, non-oily texture. Lightens from within epidermis level. Reduces dark spots. Evens skin tone. SPF 30 PA protects from UVA, UVB and visible light. How to use: For a smooth, flawless complexion, simply squeeze a small amount of Ponds BB fairness cream onto fingertips, dot the forehead, cheeks and chin. Then, blend and spread outward towards the hairline and jawline for an even coverage. 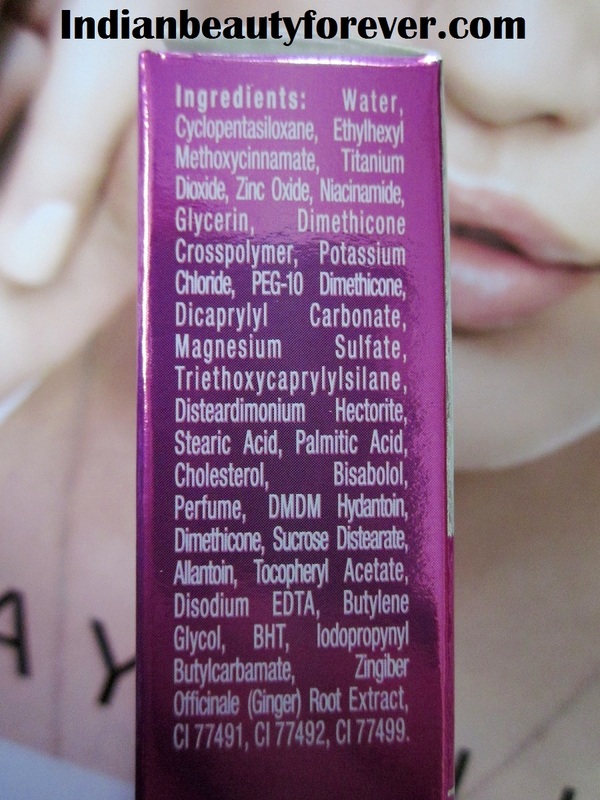 Experience- I was at the counter a weeks ago, checking out some Enrich satin shades, I saw this along with the Garnier BB creams. I told the SA to pack this one too. It’s just while giving him my card I realized I already placed an order with Medplusbeauty that includes this too, I told him hurriedly to take it out., SA laughed and did the changes in the bill. This was the third time it happened with. Arghh.. and the previous two times I bought the products too, thankfully they turn out to be good enough so anyways I would have repurchased! This BB cream unlike the other two (Garnier and Maybelline) comes in a long slender white tube with a long nozzle and a silver cap. Packaging looks good!! I am a sucker for good smelling products and the other two has okayish smell but somehow weren’t pleasant either but thankfully, this isn’t the case with this BB cream. It has a mild fragrance that isn’t artificial or overpowering. For the first time, I swatched it at the back of my hand and realized that it doesn’t have that much of moisture content as that of the other two. I keep on comparing, so that If you have used any of the other two, you may relate to what I am saying! BB cream is available only in one shade and I realized that the pigment in it has a bit more yellow than the other two. Majority of our skin tones have prominent yellow undertones so, considering this fact that it has more yellow pigment, it will suit most of us but this! And will not give that whitecast that you get when you’ve used foundation a shade lighter than your skin tone. however, I am not sure how it will fare for dusky beauties! 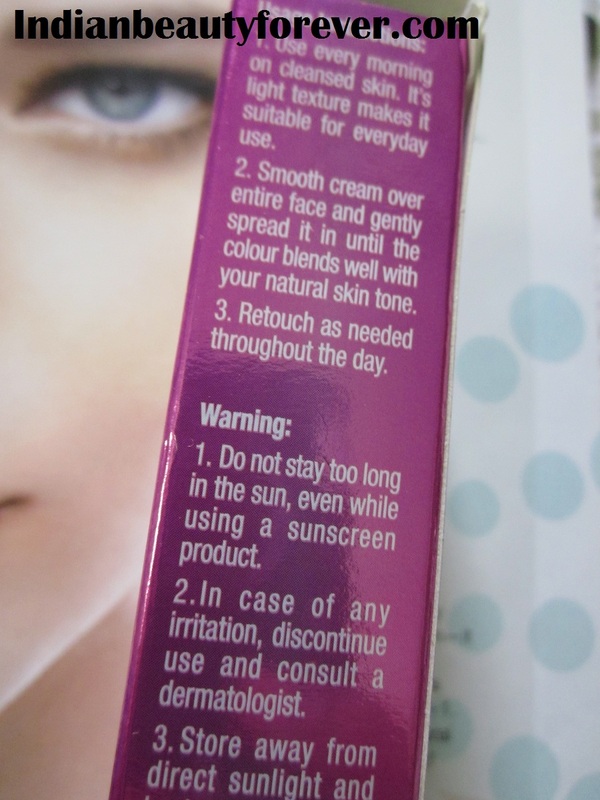 It has SPF 30, which is good, I still use my Lotus Herbals sunscreen gel before using it! Love that sunscreen! It’s less greasy as compared to the other two that makes it a better choice for summers, reason being Garnier BB cream did a good job for me in winters while in summers it use to make me oily which needs regular touch ups, this one seems pretty good for combination to oily skin. It’s true that it even tones the skin and conceals minor flaws but it isn’t a foundation so expect only a sheer coverage. I have combination skin with normal cheeks, oily T zone. Ever since I have been using it, I noticed, after sometimes, say 2-3 hours, my oily areas starts getting shiny. Well!! I will not blame any foundation or BB’s for that as it happens with almost every one of them that I had to take care with the help of a compact. But for a normal to oily skin it may prove to be a decent everyday sheer cover cream for a natural look. I think girls with dry skin may use some moisturizers on the dry areas before using this, or wherever required! Did I mention that less than a pea sized amount is adequate, at least for me.. It’s 125 INR or 18 g while Garnier was 99 for 18 gms and Maybelline 199 INR for the same quantity. This pack will last less than a month, if used regularly! 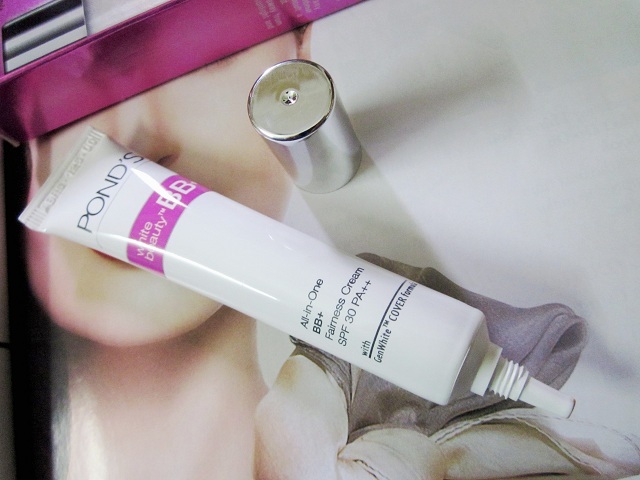 This Ponds BB cream claims to lighten the complexion, which errr I haven’t noticed yet or it needs more time! That’s true that it doesn’t clog pores as I have pores on my nose and I am always afraid that any new product should not clog them which eventually leads to whiteheads but thankfully and happily I can say, it hasn’t done yet. Moreover, you have to make sure that you exfoliate your face properly or the oily areas if they are prone to blackheads or whiteheads. This, reminds me I have to go and exfoliate.. going after this post. :D Seriously hate those pearly whiteheads on my nose. Update: After this BB cream I have used Lakme CC Complexion Care cream and which is a decent product at the price as well. Easily available in drugstores and online. Price is fine for the quality which makes it affordable and trial pack is also available so if you would like to try it first go for the smaller pack. Does conceal and makes the skin even tone to certain extent. It’s fared well for oily combination skin during this hot summer, for sure for will do the same for normal skin type. Dry skinned people may moisturize wherever needed if they really want to use this BB. Has SPF 30 for sun protection. Oily areas tend get shiny after a couple of hours! Skin lightening claim may not be completely true or I need to give it some more time. My take: Those of you who are looking for a decent everyday cream that can give sheer coverage then Go grab the trial pack to try it! however, if you want decent coverage then good to skip this. Other than that it is affordable, comes with pleasant fragrance, SPF 30 and a formula that doesn’t clog pores. I really liked it for my skin type in this hot weather. I tried this in a store. Waay too light for me, I felt. Might not get it. I am kinda irritated with so many different BB creams cropping up. :D Using the Lotus sunscreens now. Yeah, even I felt that even though it is sheer cover but still may not suit all the skin tones and that's bad they have only one shade to choose from. I like lotus sunscreen too. Nice review Neish! :) Hope you enjoyed your weekend. Why Shikhu, is that the coverage or any other thing? I am using this one daily now for office wear. But if I have to stay outside in the hot weather then I don't prefer this. Nice review Niesha. Thanks Nisha. I know, it kind of melts but while we are indoors it's fine and pretty good! I wanted a review on this :) So thanks. I think it is not for me but I will forward the link to my friend who too wanted to buy this one. The review will help her decide. Thanks dear! yup, you can try the smaller pack to check how it fares for you. Even I saw the Rimmel one the other day! Wow, I've never seen ponds have cosmetics here in singapore! I'm so surprised by the pigmentation! Hope you get lots of use out of this! I've got so much foundations right now and I just got a new bb cream from face shop to try! So if you were to choose just 1 BB Cream, which one would it be? As per my skin type and keeping in mind the hot weather, Pond's fared well! Garnier was good for winters. Nice. What about the Maybelline one? Maybelline was the first one that I had used but it is pricier and trickier to blend, else may leave a white-cast as compared with the options that we have now a days, with the same sheer coverage. Thank you Radha! It's good for my combination skin! Hope you like and it suits too.